I'm always looking for ways to save money AND calories, if possible. New Pure Via Stevia Liquid Sweetener does both. I can keep it easily on my desk, so I can have sweetener at my desk when I make my morning tea - versus purchasing it en route (and ensure none of my coworkers "borrow" it, a problem in some office kitchens). You just squeeze it in your beverage, I didn't even need a spoon. Another bonus - it also works in cold beverages! It has a clean, sweet taste - and has ZERO calories. Pure Via stevia extract is 97% Pure Reb A made from the sweetest extract of the stevia leaf. It is sweetened using all natural stevia. No drip lid. Great in hot & cold beverages. 1 squeeze is equivalent to 1 teaspoon of sugar. Pure Via liquid sweeteners are suitable for people with diabetes. The container is so small it could easily fit in your purse - or diaper bag - to sweeten drinks on the go as opposed to using sugar. One lucky YYZ Bambina Reader will win a Pure Via™ giveaway basket valued at $150. Enter before October 13th, 2014! Disclosure: I received Pure Via for the purpose of this review. As always, opinions on this blog are my own. I would love to use this in my tea and coffee! I would use it to sweeten my iced tea and also for the homemade lemonade I like to make in the summer. I would use it in my shakes. I would use it in my tea and coffee. I would use it to sweeten home made lemonade. I would use it in my tea and I would bake with it. I would use it in my coffee and in my baking. I would be using Pure Via in my coffee. I would use daily in my coffee and would try their recipes as well! I'd use it in baking! I would use it in tea and in my baking. I'd love to use it in dessert recipes! I would use it to sweeten coffee. I would use it for when i bake cookies and cakes :) Thanks! I would at first try it in my coffee! We would use it in our coffee! To sweeten summer lemonade and winter apple cider. I would use it in my smoothies. use it in my shakes. I would use Pure Via in my baking. I would use it in baking. In my tea for sure! I would wish to try it for sweetening my fave muffin recipes. I would use it to make fresh lemonade - as a sweetener for it. I'd use it to make big batches of lemonade! I'd add it to my iced coffee. I would bake some cookies! I use it in baking for my Mom, she's diabetic. I also use it in beverages for get togethers as many of my family members have to avoid sugar for reason or another. I'd use it in my tea and coffee. 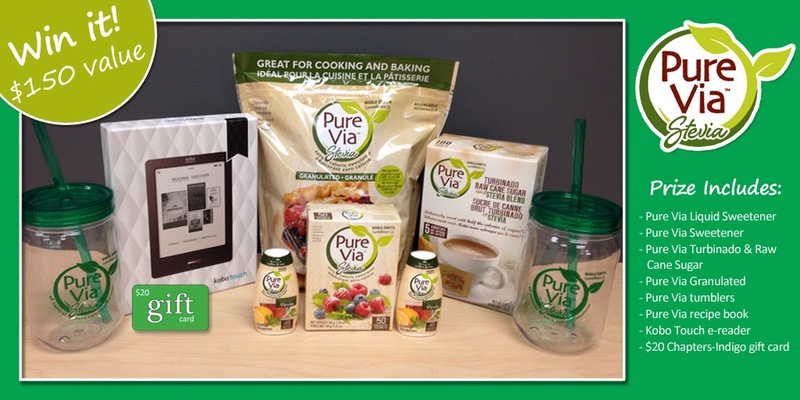 It would be great to win a Pure Via basket. How would you use Pure Via? I would mainly use it in drinks, but I might try out a recipe with it as well. i would it in my tea each morning! I would use it in baking!! Bailey Dexter I would keep the small bottle in my purse for anytime I am out and want to add in. Our family is gluten free & I would love to do my cooking & baking with it. It's and hard to find a good product that taste good as well! I would use it in coffee, smoothies & baking. I would like to use Pure Via in my baking. We make a lot of muffins.